We’ve already shown you the proposition from Hamburg’s 2024 candidacy, there are confirmed bids from Budapest, Paris and Rome. Now four European metropolises have a new competitor from the US. After the collapse of Boston’s bid now Los Angeles takes over. Just in time, two weeks before the IOC deadline. The City of Angels would thus host its third ever Olympics after the 1932 and 1984 editions. As if this wasn’t impressive enough, its main venue would be the century-old, monument/heritage-listed Memorial Coliseum, which also held both previous editions. Using an existing structure is considered part of the new cost-efficient model of holding the games. However, Los Angeles would still see major alterations done to the stadium. Here’s what we managed to find in LA’s bid book. The concept foresees complete revamp of seating within the existing bowl of the stadium. In athletics mode the Coliseum would be equipped with a raised platform covering some of the lower rows, allowing for a larger playing field and at the same time limiting capacity significantly. However, it should be no less than 65,000 seats for the Olympics. Afterwards some 14,000-15,000 (by the Bid Book indications) would be uncovered and made usable for football, raising the size to almost 80,000. The project’s introduction should cost $800 million, of which vast majority would be covered by University of South California, 98-year lease holder and stadium operator. Further structural changes (not part of USC obligations) would require $100 million and additional tournament-purpose alterations should cost $200 million. 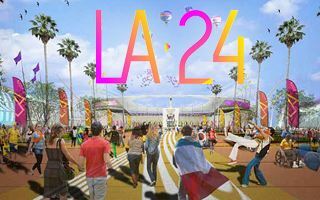 By 2024 Los Angeles will have two soccer-specific stadiums. One of them is the well-known StubHub Center, home to LA Galaxy. The other will rise along with a new MLS franchise, LAFC. Its location is important to the bid, it’s planned just beside the monumental Coliseum. There’s an irony to these stadiums’ use, though, because none of the two would be used for the sport they’re built for. StubHub Center would serve as the main rugby stadium, while LAFC Stadium would be transformed into temporary aquatics center for the games. Soccer/football games would be held primarily at Rose Bowl, the giant of Pasadena which previously hosted the 1994 World Cup and was since modernized significantly.